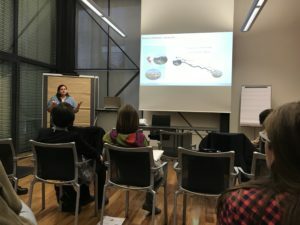 This past November, Dr. Carla Barbieri (Associate Professor and Extension Specialist) and Claudia Gil Arroyo (doctoral student) in Parks, Recreation, and Tourism Management at NC State traveled to Bolzano, Italy, to participate in the first-ever World Congress on Agritourism hosted by Eurac Research. “World” is no exaggeration, as the two joined scholars, farmers, and representatives from government and not-for-profit organizations from every continent to exchange knowledge, best practices, and future paths of agritourism. Dr. Barbieri presenting “Agritourism in US & Canada: What We Know and Don’t Yet.” Photo courtesy of C. Gil Arroyo. 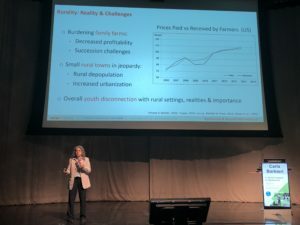 Aside from serving on the congress’ Advisory Board, Barbieri and Gil Arroyo delivered presentations from research conducted in the Agritourism and Societal Well-being lab. As the academic keynote speaker, Barbieri presented the advances and the future directions of agritourism research in the US and Canada. Gil Arroyo led a panel session on the contribution of agritourism for the future of rural areas. She also presented on gender roles in community-based agritourism, a study she led in the Peruvian Andes. Illuminated throughout the congress was the vast differences in agritourism across the globe–from visitation duration to activities explored in the agritourism experience. For example, agritourism in Europe might involve a month-long stay on a farm, milking cows and harvesting eggs, while agritourism in the US would consist of an afternoon at a local corn maze. As revealed through Gil Arroyo’s panel session, gender roles mark a notable difference in operations across the globe, with female farmers holding a significant and empowering presence in the US and Peru, and a stifling presence in Mexico. Gil Arroyo delivering her presentation on gender roles in community-based agritourism from a study in the Peruvian Andes. Photo courtesy of C. Barbieri. Despite differences, agritourism shares rich common ground. Commonly understood as the agricultural-based operation that brings visitors to farms, agritourism provides authentic exposure to agriculture, promoting and sustaining rural ways of life. The congress proved successful in unifying this vision with a deeper and universal understanding of agritourism. This discussion reassured agritourism as a “strategy from farmers for farmers,” which is critical to increase the farmers’ income and serve as a robust tool for development in rural areas. As Jacqui Taylor from Africa Calling emphasized, through agritourism, the livelihood of rural communities can continue its expansion and celebration. The congress also illuminated the many happenings, collaborations, and the promise of opportunity to come. Attendees expanded their networks seeking to share resources, tools, and means of support in agritourism endeavors. To maintain the exciting momentum, planning has begun to ensure meeting every two years, as opposed to every four as previously envisioned. In the meantime, attendees will channel the inspiration, while the writings from presentations are being prepared for publishing. You can experience some highlights of the 2018 Congress by accessing the live streams of the main presentations. 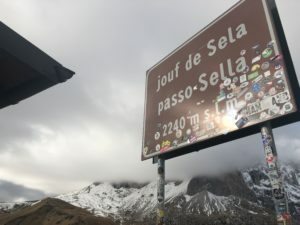 Scenery and signage in Bolzano, Italy. Once Austrian territory, Bolzano shares both Italian and German cultures (and languages!) and hails as an agritourism hot spot. Photo courtesy of C. Gil Arroyo.